We are the leading manufacturers and supplier of polygonal tents for sale. Our polygonal tents are a flexible, cost effective and robust way of covering space, using modular framework elements you can extend to any length or shape. 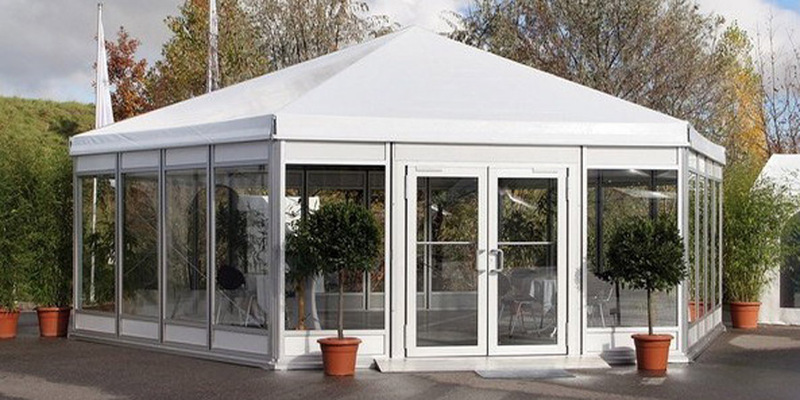 We offer a choice of polygonal frame marquees to suit a wide range of uses. Whether you need a fast and stable structure or need a bespoke structure for a particular site, we can offer a solution. We have been designing and making frame structures for over 25 years, so, whether you need a connecting walkway, a catering tent or a structure for 2000 plus people, we can be your one stop shop for your entire tents requirement. We manufacture tents for wedding, party, exhibition, function and all types of events and arenas. •	Polygonal Tents Material: Aluminium, Structural 6261 T6 Grade Extruded Aluminium. •	Simplicity: Polygonal tents conform to traditional geometric figures and shapes. This reduces time, cost, material, and weight.